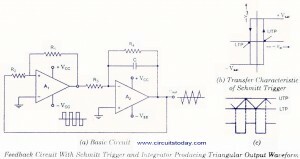 How to make a Triangular waveform using Schmitt Trigger and Integrator ? Another triangular-waveform generator that needs fewer components is shown in figure. The arrangement consists of a non-inverting Schmitt trigger Ax and an integrator A2. The output of a Schmitt trigger is a rectangular wave that drives an integrator. 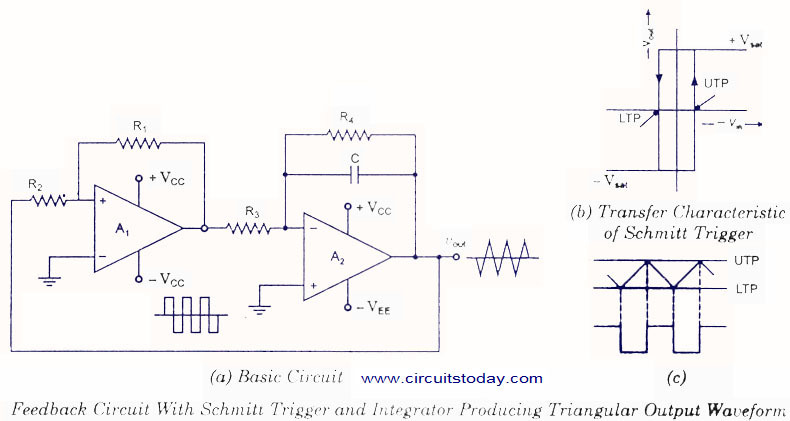 The output of the integrator is a triangular wave, which is fed back and used to drive the Schmitt trigger. Thus first stage drives the second, and the second drives the first. But the question arises on how the circuit gets started in the first place. This is explained below. When the Schmitt trigger is connected to power supplies for the first time, the output of the Schmitt trigger must be either low or high. When the Schmitt trigger output is low, the output of the integrator will be a rising ramp while for Schmitt trigger high output, the integrator will produce falling ramp. Either way, the triangular waveform has started, and the positive feedback will keep it going. The transfer characteristic of the Schmitt trigger is shown in figure. When the output is low, the input must increase to the UTP to switch the output to high. Likewise, when the output is high, the input must fall to the LTP to switch the output to low.Â The triangular-wave produced by the integrator is capable of driving the Schmitt trigger. When the output of Schmitt trigger is low, the integrator develops a rising ramp which increases till it reaches UTP, as illustrated in figure. At this point the output of the Schmitt Trigger switches to the high state and forces the triangular-wave to reverse in direction. The negative or falling ramp produced by the integrator now falls till it reaches LTP, where another Schmitt output change occurs.